Pigling Bland is a peach coloured pig wearing a brown jacket with the words, “Pigling Bland” in gold lettering on the bottom left. He also wears a blue and white striped shirt and tan coloured trousers. Pigling Bland has blue button eyes and wears a light blue tie. He carries a brown walking stick in his left trotter and a knotted red handkerchief bag with a white flower pattern in his right trotter. keeping pigs and sketched them for this story. Pigling Bland was released on 5th June 2006. 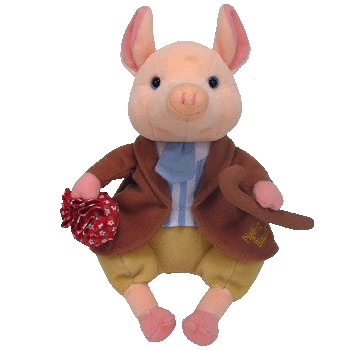 He is based on the character, Pigling Bland, from the Beatrix Potter book, The Tale of Pigling Bland. There are two versions of this Beanie Baby. This one, with the gold lettering on his jacket was exclusive to The World of Beatrix Potter in Cumbria, UK and Harrods, UK. There was also another version with blue lettering that was available for general retail in the UK.